When on Colombia’s Caribbean coast, I spend the my time in the places I know best: the small communities that pepper the highway in Bolívar. In order to truly enter into a costeño rhythm, it is imperative to leave the city and experience life in a pueblo. Still want the beach? A great route to travel is from Cartagena to the beach town of Tolú, a still primarily Colombian vacation destination. Forget about Brasilia or other Greyhound like equiva- lents, forget about air conditioning and scheduled stops: the best way to travel on the coast is to make the journey just as important as the destination. Head down the street about two blocks from the main Cartagena terminal, to where the brightly coloured converted school buses are parked and hop on board. All bus journeys are accompanied by the accordion-heavy rhythms of vallenato, urban based champeta, or traditional cumbia, all played a top volume. As the bus lurches and stops along the highway, the bench seats fill with families and the aisles with everything else: bags of produce, machetes, stereos, mattresses and furniture to name a few. My favourite stop for lunch and the afternoon is the town of Mampuján, a small afro-Colombian community located on the side of the highway in the municipality of Maria la Baja. 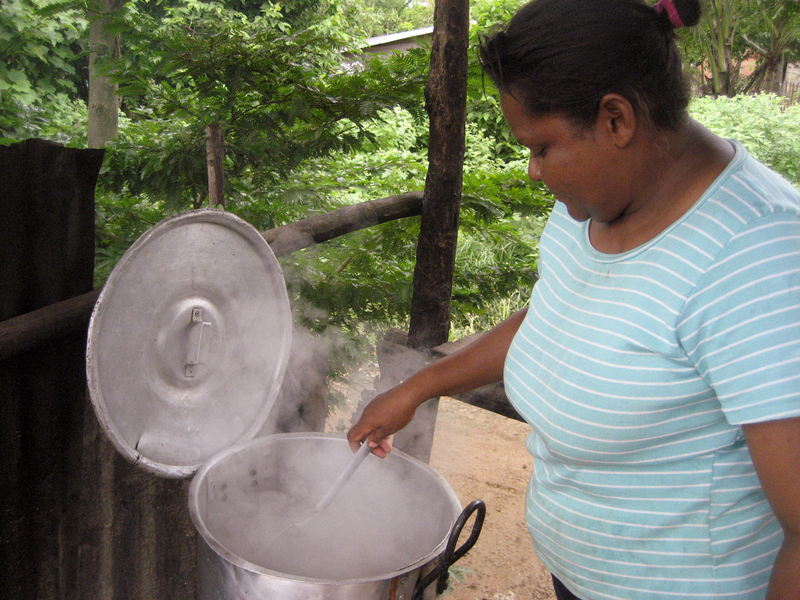 In Mampuján, the local eatery of choice is a roadside soup stand. Run by two sisters, who have used their earnings to send all of their kids to school, Gladys and Dionisia alternate cooking days, but the menu never varies. Sancocho, a soup filled with local crops of ñame, yuca, corn and beef ribs, all cooked over an open fire, and served with rice on the side is the order of day, everyday. And everyday, people line up outside with their cooking pots, waiting for their turn to purchase lunch to go. I prefer sitting at the wooden table to eat, in order to chat with the cooks and watch farmers bicycle back to the community after a long day in the fields. New houses in Mampujan Viejo. 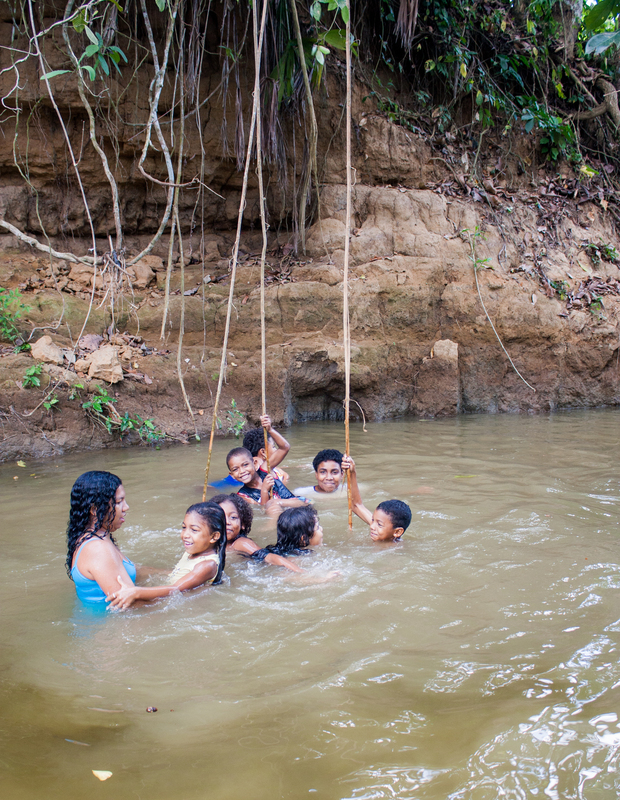 Sometimes, however, I forgo eating lunch at the soup stand and tag along with community members to the arroyo, or creek, in Mampuján Viejo for the afternoon. 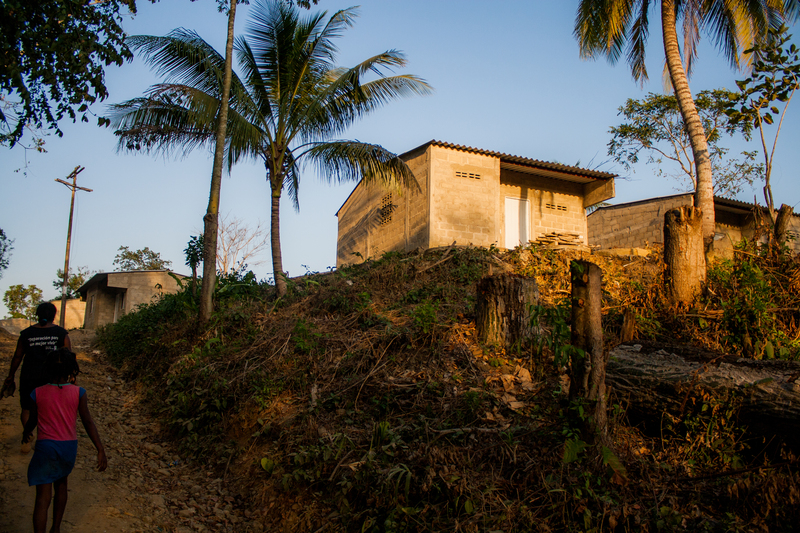 Mampuján was displaced by paramilitary forces in 2000 and community members eventually resettled when an Italian priest purchased a tiny farm in their current location. 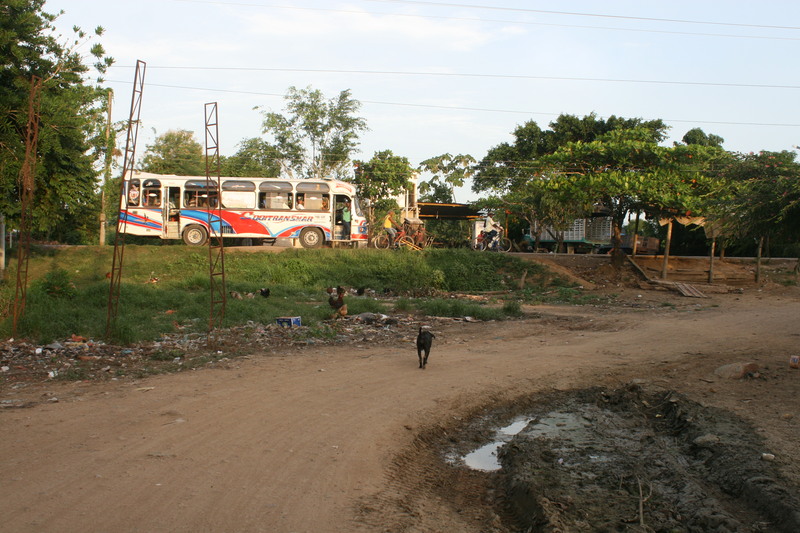 The town recently became the first community to receive reparations under the Justice and Peace Law of 2005; part of these reparations involves a return to the original location of their displacement. Homes are starting to be built and every chance to return, even for the afternoon, is filled with hope. The community’s dream is that this location will one day become a living museum, a testimony to their resistance and their faith in a peaceful future. Arroyos, not mar, are where most costeños go to relax with their families and friends. In the days before displacement, each social group had their own spot: where the women washed clothes, where the kids played, where older men talked shop and told inappropriate jokes, where young people splashed and flirted. Today, everyone swims together and in between seeing how long they can hold their breath underwater, they tell stories of the old days and of the future. A day at the arroyo is not complete without a Sancocho simmering on the bank, with corn roasting on the coals of the woodfire the kids have gathered from the nearby forest. Depending on the season, fruit, from mangos to teeth staining caimitos, are picked straight from the trees and eaten in the water. Coastal afternoons are long and lazy,no matter the pueblo. In order to escape the heat, they are best spent in a ham- mock or seated in an ubiquitous plastic chair under a tree, in a position to catch the breeze. Now is the time to, as the locals say, “echar cuento”, or directly translated, to throw a story. Ranging from an event of that morning, to something that took place years ago, afternoon storytelling sessions are a highlight of relaxing with people who still very much belong to an oral culture. In Mampuján, stories of community leaders and their struggle for justice have become incorporated into the tradition. Everybody has something to share, and sessions are long and loud, punctuated with laughter and gossip. As the light turns golden and women head inside to start cooking for the eve- ning meal, I say reluctant goodbyes and catch one of the last buses passing by on my way to Tolú. While not the same as a pueblo, Tolú’s ocean breezes, bicycle taxis and small town feel will have to do until the journey back to enjoy more of the “calor humano” of costeño communities. Great piece of writing Anna!